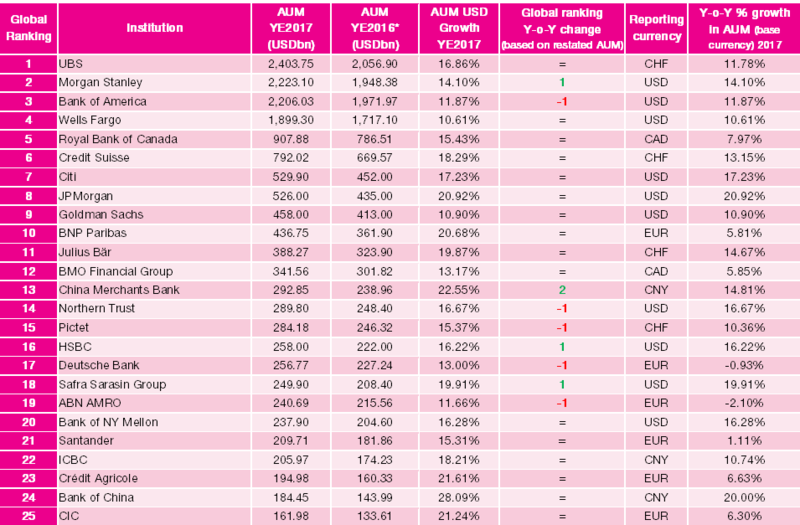 LONDON – Assets Under Management (AUM) at the top 25 global wealth management operators grew 17.0% on average this year, finds Scorpio Partnership’s 2018 Global Private Banking Benchmark. This means the top 25 operators now collectively manage USD16.2 trillion. Just as a rising tide raises all boats, wealth managers were able to capitalize on favourable market conditions in 2017 as a core driver of growth. The FTSE All-World Index advanced nearly 22% during the year and global economic growth was estimated to have reached 3%, an uptick from 2.4% in 2016. However, there were also positive indicators that firms achieved greater success in drawing additional assets from new and existing clients in 2017. On average, the contribution of Net New Money to AUM, which was flat in 2016, rose to 4.3% in 2017 for those firms who declared this data. Source: Scorpio Partnership Global Private Banking Benchmark 2018. All results rounded. Note 1: AUM YE2016 figures have been restated to adjust for changing methods in financial reporting by private banks and in some cases are not consistent with previous years’ press releases. Note 2: Benchmark AUM data aims to represent actively managed assets of private clients who hold more than USD1 million (or the local currency equivalent) with the firm. We note that not all firms conform to this reporting methodology. Where applicable, financial data was converted to USD using the corresponding end of year exchange rate. – Bank of America Merrill Lynch’s Global Wealth and Investment Management division AUM includes Merrill Lynch Global Wealth Management (MLGWM) and U. S. Trust, Bank of America Private Wealth Management. The firm reports total client balances of USD2,751.9bn including USD1,080.7bn in AUM and USD1,125.3bn of brokerage business for this division. Assets in custody of USD136.7bn are excluded, as well as banking deposits of USD246.9bn and loans and leases of USD162.1bn for this client segment. – Wells Fargo AUM includes Retail Brokerage assets of USD1,651.3bn and Wealth Management Client assets of USD248bn. Retail brokerage figure encompasses both retail and HNW assets; a breakdown of HNW private client assets is not publicly available. – Citi’s AUM is for accounts over USD1 million including Citi Private Bank assets and Global Consumer Business accounts over USD1 million. – JP Morgan’s AUM of USD526.0bn only refers to assets actively managed on behalf of Private Banking clients and does not include Brokerage and Deposit assets. The addition of custody, brokerage, administration and deposit accounts would give total private banking client assets of USD1,256.0bn. – BMO Financial Group AUM refers to BMO Wealth Management division. “Conditions have been exceptionally positive for global wealth management in the last 12 months, but wealth firms must also be given credit for starting to find new revenue” says Caroline Burkart, Director at Scorpio Partnership. “Our client engagement assessments throughout 2017 have indicated that client sentiment is on the up which is inevitable when markets are good. Asia’s wealth managers achieved the most significant gains this year, with average AUM growth of 15.2% (in base reporting currency), compared to 7.5% among European operators and 13.8% among firms based in the Americas. Many wealth managers present in Asia continued to increase their focus in this region in 2017. In several emerging markets, strategic acquisitions contributed to inorganic growth in AUM. Most notably, Bank of China – a new entrant to the top 25 table last year – stood out by reporting double-digit growth for a second consecutive year. The firm attributed its success to effective marketing, customer developed client profiles and proposition enhancements. Costs are on the rise for top wealth management firms again, growing 8.1% over the course of the year. Investments in technology continued to be a key driver of expenses, with many firms looking to improve both front office functionality and client experience but also back office infrastructure and operations. In spite of these increases, income grew at a faster rate in 2017, rising 13.9% on average. As a result, profits rose over 25% and cost-income ratios fell below 70% for the first time since 2007. Source: Scorpio Partnership Global Private Banking Benchmark 2018. Scorpio Partnership is a London-based strategy and research specialist focused on the global wealth management industry and the HNW client journey. In addition to its industry benchmarking, Scorpio Partnership’s unparalleled insight into the market is based on over 100,000 interviews with millionaires and billionaires and 12,500 professional advisors across 35 global wealth centres. The firm is a market-leader in client experience insight programmes, working with a number of wealth managers globally to help them track and assess client insight. The Global Private Banking Benchmark 2018 collects data from top wealth management institutions around the world from which to develop the key performance indicators. To ensure consistency in the analysis, the analysis seeks data relating to the firm’s actively managed high-net-worth private client assets, including discretionary portfolio management, advisory portfolio management, securities or brokerage accounts, own mutual funds, term deposits, fiduciary deposits, savings accounts and managed trust assets. More specifically, the analysis aims to identify data relating to private clients who hold more than USD1 million (or the local currency equivalent) in actively managed assets with the firm. We note that not all firms conform to this reporting methodology. For further details on the reporting guidelines, please contact us directly.